Golf, the game that some don’t even consider to be a sport, is within a group of recreational sports that see a higher incidence of injuries than team sports such as hockey and rugby, according to a National Health Statistics Report (NHSR) published in November 2016. In a press release, Golfsupport.com presented golf injury data from the NHSR that may surprise you. The site also mined information from additional studies by the British Journal of Sports Medicine, the Norwegian School of Sport Sciences, Golf Digest and the American Journal of Preventive Medicine. The numbers are revealing and suggest what you might not know: playing golf poses many physical risks, resulting in lots of injuries to amateur and professional golfers each year. Judging from the data, it’s reasonable to conclude that golf is pretty risky and somewhat dangerous as compared to other sports. Tiger Woods has suffered 17 golf related injuries in his career. “Results of the research analyzing the risk of injuries per sport, and in particular golf, reveal that the risk [in golf]is much higher than commonly thought,” said Dr. Gary Swift of Golfsupport.com. NHSR examined 8.6 million sports injuries from 2011 to 2014. 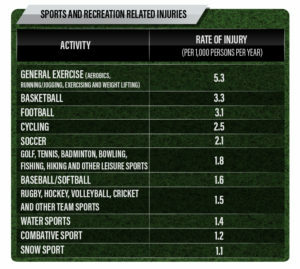 Recreational sports (golf, tennis, badminton, bowling, fishing and hiking) had an injury rate of 1.8 per 1,000 persons. Conversely, rough-and-tumble team sports such as hockey, rugby and lacrosse were lumped in a category that had an injury incidence of only 1.5 per 1,000 persons. Other so-called rugged sports that also had less injury risk than golf (1.2 or 1.1 per 1,000 persons) included combative sports and snow sports. A study by the British Journal of Sports Medicine provided additional insights about golf injuries. The study said 15.8 to 40.9 percent of amateur golfers suffer injuries each year, and 25.2 to 67.7 percent over a lifetime. Professional golfers can expect a higher incidence of injury, from about 30 to 90 percent, both annually and during their lifetime. Most golf-related injuries are to the lower back (15.2 to 34 percent), elbow (7 to 27 percent) and shoulder (4 to 19 percent). There are also wrist injuries. Some golf injuries can be extreme or even deadly, like those involving the head. Many are due to airborne golf balls and flying club heads. Each year an estimated 40,000 people make a trip to the emergency room after being struck by a golf ball or club head! If this wasn’t enough, 15,000 injuries per year are blamed on golf carts. 15,000 injuries each year are due to golf carts crashes. Danger lurks on the golf course—and it’s not just slick greens, deep bunkers, OB right and all manner of water hazards. Physical injury is a real possibility, even likely. But don’t let the injury risks stop you from playing the game. Awareness, precautions and fitness can help protect you from injury.